1999 Insert: lists Spartacus as coming soon and it has the original style banner. 2000 or 2001: lists a number of coming soon that were severely delayed or never came, and also shows some alternate cover art (38MB) Dodes Ka den (severely delayed) is also listed as Widescreen. 2002 insert: notable for a few titles listed as coming soon but delayed (also listed Howards End which ended up initially being part of the Merchant/Ivory line). Anybody have any news on Visconti's The Damned? Does Warner still have rights to this? I expect that they will be published as double release and that the documentary about the casting of DIV (never seen it) called "Searching for Tadzio" will be included in hd as an extra. These for me are days of trustful waiting, hurry up Criterion!! Did you know that Miguel Bosé, son of the Italian actress Lucía Bosé, was chosen by his godfather Visconti to play Tadzio in the film? The father - a Spanish bullfighter - objected and this forced Luchino to find a new boy in Scandinavia. There are many interesting stories about Death in Venice..
'Pixote' was released here in Brazil on DVD, in a 4x3 copy, which is absurd. (many of our most important classics either remain unreleased or were released in pan-and-scan or non-anamorphic DVDs. Ugh.) A Criterion edition would be most welcome, even if in a collection like 'Limite'. The thing is is that a lot of my Brazilian friends don't know anymore about their own film history thank folks in the US do. From my own observation my friends would much rather consume Marvel films rather than their own cultures films. Hell, the US even produced a Woody Woodpecker film (Pica Pau) that was released in Brazil before the US and that did better over there than it did here! Perhaps I haven't met enough Brazilians but I doubt many would be rushing out to see Pixote anymore than a US citizen would. It's a good thing to have released as my fear of a looming Bolsonaro isn't going to do Brazil's cultural heritage any favors. Isn't that basically true around much of the world though, including in the U.S. (or even especially)? I have a Japanese co-worker/friend that comes here every so often, and he didn't even realize that Japan was there making films near the beginning. He's aware of modern Japanese films, but completely oblivious to most older ones, and from what he's told me I gathered he's mostly watching American films (i.e. Marvel, etc). Perhaps I haven't met enough Brazilians but I doubt many would be rushing out to see Pixote anymore than a US citizen would. I'm sorry to say your assessment is accurate, at least in terms of contemporary times. 'Pixote' was a success back in 1980 (2.5 million tickets sold), but nowadays it's mostly television-like comedies or religious biopics that draw big crowds. I haven't seen a Brazilian film on the big screen since 2008, because none of the interesting ones play anywhere near me. However, I suspect that our indifference towards our own cinematic heritage stems at least in part from both the lack of availability and the poor quality of the copies of the relatively few classics released on DVD. If not even dedicated cinephiles can get their hands on decent copies of the work of filmmakers like Julio Bressane and Ruy Guerra, then how can one hope to spark interest among a more general audience? Mind you, even when important work is released (such as the three Nelson Pereira dos Santos boxsets), the company that puts it out is dubious, the price is obscene and there is an absolute lack of technical reviews to inform potential buyers. Sorry for derailing the thread with this rather esoteric talk, but if even Kino is about to release a Joaquim Pedro de Andrade boxset on Blu-ray in the United States, then perhaps Criterion could be a bit adventurous and include Brazil a little more in their world cinema efforts. Even an Eclipse set would be thrilling! Looks like Death In Venice is certainly coming, according to the Venice 2018 screening schedule for restorations. 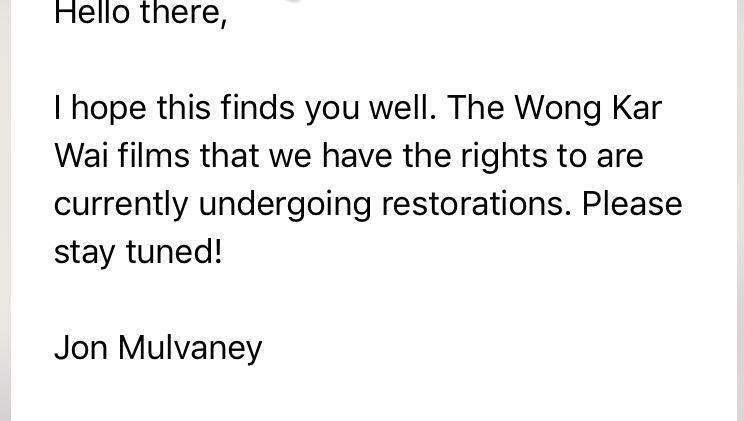 The Magnificent Ambersons - May newsletter clue; confirmed after that; on that list of OOP WB DVDs; long rumored as forthcoming; one of the most obvious WB deal selections; former Laserdisc title. Some Like It Hot - Recently confirmed via Venice restoration credits; former Laserdisc title. A Story from Chikamatsu - Was making the theatrical rounds from Janus (not one of those main-page "official tours" but one of their lower-key Janus tours they've done - like for The Baker's Wife or La Vallée). Also on Filmstruck. True Stories - Was confirmed via social media. Glad to see more from the WB deal - after a drought for most of 2018. They've really been going after former laserdisc titles. Zero surprises from this bunch - as all were well confirmed. Excited to rewatch Ambersons after having only seen it on a terrible library VHS about 10 years ago (same with Greed - so hopefully that's next in terms of lost-footage obvious WB deal picks). The big question is: It will be come with The Damned? I'm not sure if Murderous Maids has it's own thread. All I could find was this reference. My Rialto Box Set is coming soon. This is a last piece of the puzzle for my personal collection, so I was wondering if watching this would change my life. Anyone comment? It will change your life in that you'll forever wonder why you didn't just watch La Cérémonie instead (or again). I'm a little disappointed that A Story by Chikamatsu wasn't accompanied by an upgrade of Double Suicide, even though I haven't seen any indications that they were planning to upgrade the latter. Perhaps this can be the impetus for them to consider doing so. Same question Toby...i think that The Damned is the title i really wish more above all , then Death in Venice. I am wondering if a Criterion Juliet of the Spirits Blu ray might be coming soon, since there is a new Region B version being released next month from Cult Epics. I also agree that a BD of Ossessione would be most welcome. They are both based on plays by Chikamatsu Monzaemon. Criterion should do an Eclipse set, or even a December box of Chikamatsu adaptations! Possible inclusions" -- Imai's Night Drum (1958), Uchida's Chikamatsu's Love in Osaka (1959), Shinoda's Double Suicide (1969), Masumura's Double Suicidal of Sonezaki (1978), Kurisaki's Love Suicide at Sonezaki (1980 -- filmed bunraku performance, shot by Miyagawa in actual Kyoto area locations), Shinoda's Gonza the Spearman (1986), and Gosha's Oil Hell Murder (1992). Kitano's Dolls was clearly inspired by Chikamatsu, but not based on any particular work (other than the bunraku extract one sees at the beginning). Tunes of Glory (dir. Ronald Neame) got a restoration from Janus that will premiere at NYFF. Would imagine an upgrade will be around the corner. I guess Jon Mulvaney's lips are sealed unless you're somebody in the film world.